Our iconic soda syrup! Add your own soda water, add to Karo for pancakes, pour over ice cream, kick-start your coffee, sweeten up any baking or come up with something new! Works great with Soda Stream! Always made with pure cane sugar! Always made with pure cane sugar! Dublin post-mix syrup works great on fountains at a 5 to 1 ratio. 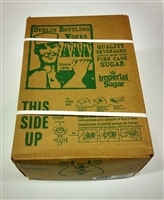 Great value...one box makes 25 gallons of Dublin Soda!